Headrail: Sturdy roll formed steel 2.264" width x 2.019" height x 0.02" thick. Bottomrail: Sturdy Extruded PVC solid trapezoid - width of downward flat 2.265" (width of upper flat 1.28") x 0.787" height. Slat: Plain finish Faux wood .114" thick x 1.969" width. Valance: Plain finish Faux wood crown valance 0.570" thick x 3.25" width. Tape Roller Support: Injection molded plastic with metal roller minimizing cord fray. Tape Roller: Injection molded plastic with ladder locking legs. Tilt Rod: Plated steel square shape 0.1575" x 0.1575"
Cordlock: Zinc plated metal cordlock with metal rivet for added strength. Tilter: Zinc plated metal housing with injection molded plastic wheel. Bottomrail Anchors: Injection molded plastic. Cord: Braided polyester .063" diameter. Ladder: Braided polyester 2.126" spacing x 1.772" height. Mounting Bracket: Painted steel with hinged locking front cover. Stylish Faux Wood Blinds are perfect for any home decor. Includes mounting hardware. 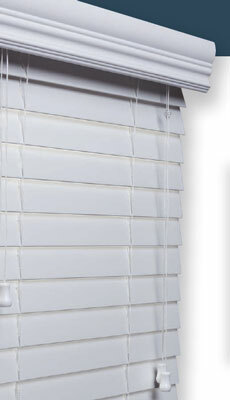 For added safety, all 2 Inch Faux Wood Blinds feature child safe tassels and warning tags. Custom Cut - Blind can be cut to exact width and shortened. Enter exact size in box. Width can be cut up to 4 inches Please note that custom cut blinds cannot be returned and require an additional 2 weeks before shipping. Do you want us to include the normal 1/2" allowance?